At IIB Medical, our goal is to provide affordable and safe Propofol treatments for ALS patients. ALS is also known as Lou Gehrig's Disease. ALS patients who have received Propofol have recently reported feeling better and reversal of their ALS condition. Although we recognize that these reports are anecdotal and not (yet) supported by scientifically gathered data, we also recognize that ALS patients have no other effective treatments. Propofol is safe if it is administered in a modern hospital such as Amerimed in Puerto Vallarta with a team familiar with the drug. We want ALS patients to have a safe and affordable place to be treated with Propofol and other emerging treatments. Dr. Raul Morales, the medical director of IIB, is an active academic representative of the University of Guadalajara. His responsibilities include establishing relationships amongst Universities worldwide for the purpose of exchanging knowledge and experiences in scientific and academic affairs. He is an associate Professor of Hematology, and a graduate in Medicine of the University of Guadalajara, Mexico. He received his post-graduate training in Internal Medicine and Hematology at the National University of Mexico with clinical expertise in Hematology and Transfusional Medicine. He is a member of the Mexican Society of Hematology, American Society of Hematology, International Society of Hematology, European Association of Hematology, American Association of Blood Banks, and The Mexican Council of Hematology (amongst other medical professional associations). Magic Johnson selected Dr. Morales for HIV treatment and flew the doctor to Los Angeles for treatment. Magic Johnson could have any physician in the world and he chose Morales. You're in good hands. In 2004, Dr. Morales was the keynote speaker at the 8th International Conference of Oncology, in Cairo (Egypt). He was invited by renowned Professor Mofeed Shehab Minister of Higher Education and Scientific Research (Suez Canal University and Cairo University). Dr. Efren Puentes, is a Neurologist with a sub-specialty in "Pediatrics" endorsed by the IMSS, Dr. Biomedical Center, and the Mexican Society of Neurology Iberolationoamericana SCHOLARSHIP 2001/2003. Dr. Puentes graduated with a specialty in Neurosurgery from The Dr. Manuel Velasco Suárez National Institute of Neurology and Neurosurgery. During his medical training, Dr. Puentes was active with neurological research both at the Dr. Manuel Velasco Suarez Institute and the National Institute of Nutrition Salvador Zubiran. He earned his MD in General Medicine at The Autonomous University of Guadalajara. Dr. Emilio Perez is an orthopedic doctor with a sub-specialty in stem cell transplant. Dr. Perez is certified by the Mexican Council of Orthopedics and Traumatology, AC, he is a member of the Mexican Society of Orthopedics, as well as the Mexican Association of Joint Re-constructive Surgery and Arthroscopy. 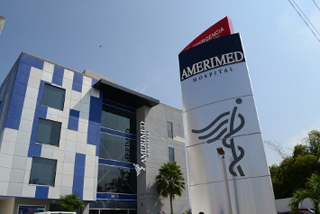 Amerimed's world-class anesthesiology department provides its very competent staff and equipment for these procedures. "the hospital network located at the main tourist destinations of Mexico, and the first organization specializing in medical tourism in the country based on US standards for quality services." To read more about our practice, visit IIB Medical. Be wary of lower fees, as the cost of a modern hospital facility, and a qualified team are such that significantly lower fees suggest the procedure is being done not in a hospital but a medical clinic or doctors office. This is not safe. Propofol killed Michael Jackson because his doctor was not in a hospital with a qualified team. Don't cut corners with this. ALS is a condition that is widely considered as having no effective treatment. Those afflicted with ALS expect their degeneration to continue and consequently lead to death. Reversal of symptoms is not considered possible unless an act of God. ALS patients began reporting on ALS.net that Propofol (a common anesthesia) made them feel much better and had positive affects on their symptoms. These benefits are temporary and disappear as the drug leaves the body, which can be a few weeks. While Propofol is considered safe if administered properly, its effect on ALS has not been studied yet and its benefits are purely anecdotal. Sadly, the bar is low for ALS therapies, consequently many in the ALS community look to Propofol for hope. In the United Sates, it is at the very least legally precarious if not illegal for a physician to treat an ALS patient off-label with Propofol. Those who do so risk their careers. As a result, ALS patients must consider medical tourism for their Propofol treatment. IIB Medical understands the importance of safety and price for patients. If you are in need of Propofol treatments, we can quote you on a custom membership which will allow you ongoing Propofol treatments within your budget.